You know how it is…. You have excellent intentions…. But when you head into the supermarket, suddenly the thousands of products available overwhelm you. So many food labels, advertisements, and even food sampling tables attempt to derail you. On busy days, just the cart traffic can be stressful. Check out these common mistakes and some suggested remedies….. 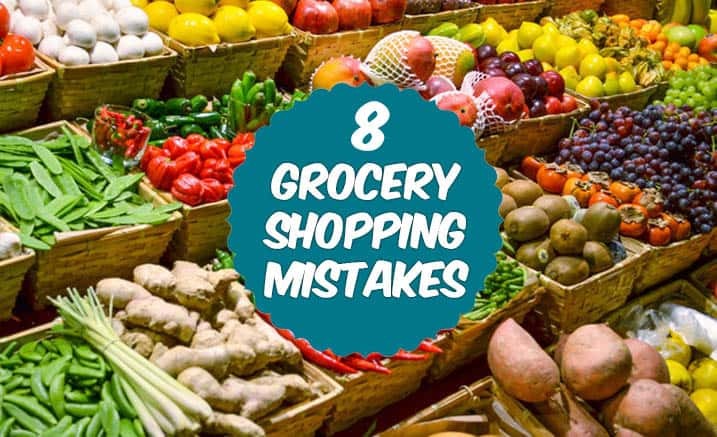 Going to the store unprepared — This is, by far, the biggest mistake people make while shopping. In order to avoid impulse purchases, or wasteful spending, be sure to plan ahead. Make your weekly meal plan, including breakfasts, lunches, dinners and snacks. List all the necessary ingredients on your shopping list. Many phone apps are out there, to help you keep organized. After you have your list of needed supplies, stick to that list! Step away from the bakery aisle and the candy in the check-out lane. Tips: Plan ahead, make a list, and stick to it. Checking the weekly specials can save you a lot of money. Shopping fresh produce in season, or seasonal offerings (think turkey in November or ham in April) is a smart way to shop. Apples may be available year-round, but certain varieties will be much less expensive in September. Watermelon will not only taste better in the summer months, it will be on sale for 4th of July week. Buying extra berries when they are on sale in the summer, and freezing them for use in winter months is cost effective. 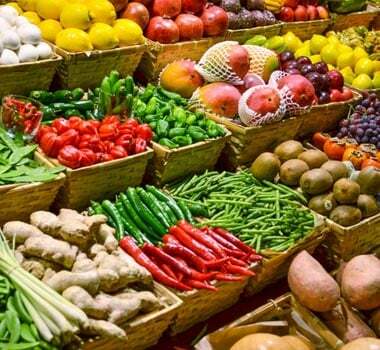 You can buy extra and freeze all sorts of fruits and vegetables – peaches, berries, asparagus, and green chiles. Weekly sale prices are also great times to stock up on stapes – canned beans, frozen vegetables, chicken breasts and thighs, and bottled water. Tips: Always take advantage of store’s weekly specials. 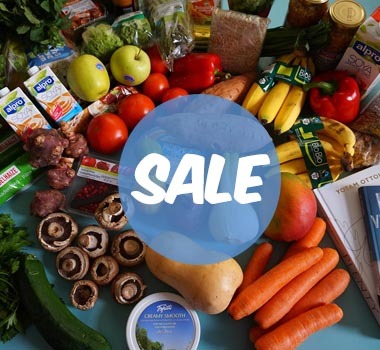 Stock up on non-perishables when they are on sale. There are so many more choices in the dairy section than there were just 10 years ago. Whole milk, 2% milk, 1% milk, nonfat milk, goat’s milk, soy milk, almond milk, coconut milk, lactose-free milk….. not to mention the trillion varieties of yogurt. 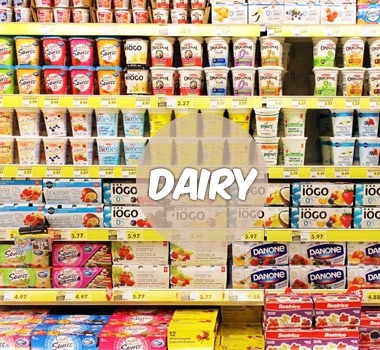 The dairy section provides you with rich sources of calcium, vitamin D and protein. But how do you decide which to choose? First, go with your taste buds. Do you like cow’s milk? Fine, now choose the fat-level that you require. Kids under the age of 2 years are typically recommended to consume whole milk. The American Pediatric Association recommends switching to 2% milk-fat after the age of 2 years. If you have a history of cardiovascular disease or hyperlipidemia, your physician will probably encourage a nonfat milk variety. Second, for people with diabetes, the important next step is to determine the carbohydrate content of the milk that they choose. For example, 1 cup (8 ounces) of 2% milk contains approximately 12-15 grams of carbohydrate. If you drink a considerable amount of milk each day, which would be more than 3 cups per day, you should consider switching to a lower carbohydrate milk. 1 cup of almond milk contains about 2-3 grams of carbohydrate. Switching could save you some carbohydrate grams to spend on another food group. As for yogurt, you need to pay close attention to the total carbohydrate grams listed on the food label. Many yogurts contain added sugars, fruity syrup or even cookie pieces, so the carbohydrate amount is highly variable. There are low carbohydrate yogurts, and yogurts flavored with artificial sweeteners that will save you some carbohydrate grams, if you are willing to consume them. Another issue with dairy, is the shelf life. They simply do not last forever, so pay close attention to the “sell by” dates on the packaging. Tips: In the grocery store, know which kind of milk and yogurt are best for you, and purchase only what you need for that week. 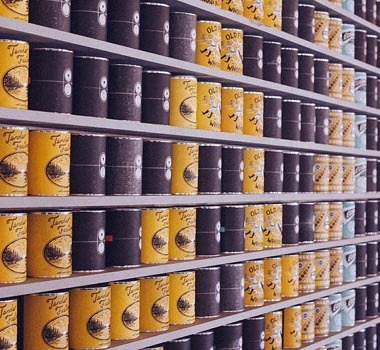 Can canned foods be included in a healthy diabetes diet? Absolutely. But, you need to be an informed shopper and consumer. Looking at canned beans or vegetables, the important thing to note is the total carbohydrate on the food label. Beans can be very high in carbohydrate, so you will need to budget your grams per meal accordingly. Beans are highly nutritious – high in fiber, protein and iron. What about refried beans? Choose the nonfat version, which are basically just mushed up pinto beans, or you can mush up your own pinto beans! Be sure to also note the sodium content of canned vegetables and soups. If you have hypertension, liver disease, kidney insufficiency or cardiovascular problems, limiting sodium in your diet is important. Most vegetables can be purchased with “no salt added,” with very little sodium per serving (< 5 mg), compared to the regular varieties (>300 mg). Soups can be purchased with reduced sodium, which may be better than original versions. Tips: Read labels carefully. Beans are your friends, as long as you include the carbohydrate content in your overall meal carb budget. Much of the advice noted above in the canned foods section can be applied to the frozen foods section. Reading the labels is paramount. Knowing that the frozen pepperoni pizza contains 60 grams of carbohydrate in the whole pie is important to know before you consume that meal. Checking the total carbohydrate content AND the serving size will steer you in the right direction. Paying attention to the sodium content, if that is an important component of your medical care, will serve you well because many frozen foods are loaded with sodium for preservation purposes. 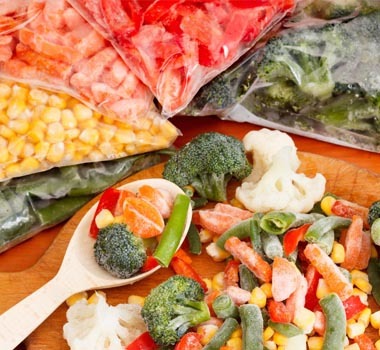 Frozen plain vegetables are a great choice for stocking up on sale weeks, and increasing the fiber and bulk of all of your meals. Tips: Read labels carefully. Skip the frozen treats and desserts. And, remember to include ½ of your plate with non-starchy vegetables! The biggest mistake I see people making in the vegetable section is avoiding it, or sticking to their old stand-bys…. Never branching out into new territory. If you have never tried Brussels sprouts or butternut squash or eggplant…. It’s time to experiment with a new recipe and explore those taste buds. If you are a parent, this is a fantastic opportunity to get your kids involved with food choices, food preparation, and food tasting. If your family hates the result, fine! At least you all tried it! If you like the result, you have found a new staple and expanded your horizons! Tips: Find a new vegetable your family hasn’t had before, and try a new recipe this week! Just because you didn’t like that vegetable as a kid, doesn’t mean you can’t love it when prepared in a new way. 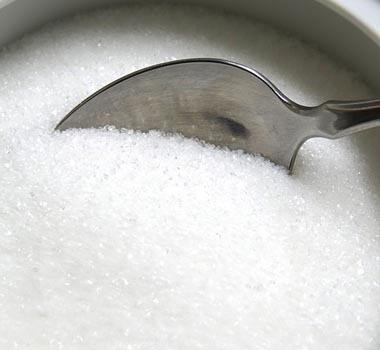 “Fruit has too much sugar!” Heard that one before? While it is true that the calories in fruit are 100% carbohydrate, think of all of the benefits of eating fruit. 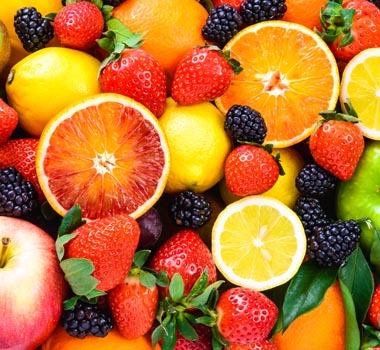 Fruit is a rich source of fiber, vitamins and electrolytes. Fruit is a tasty way to get a little sweet flavor in your diet without eating super sweet desserts. An apple contains only 60 calories, and about 15 grams of carbohydrate. A typical serving of fruit is about the size of a baseball (apple, peach, nectarine, orange, pear) or 1 cup of grapes, cherries, berries or melon. Tips: Limit fruits to about 3 servings each day, but do not avoid them completely. Does this mean that lite pancake syrup is better? Not necessarily because it contains the artificial sweeteners that many people are trying to avoid. But, it does indeed contain lower carbohydrate in the same amount of volume – that is a fact. Using honey in place of white sugar may be a less-processed way of ingesting your carbohydrate, but don’t be fooled into thinking that honey is healthier. The facts don’t lie – it does not contain a lower amount of carbohydrate. Tips: Be smart and know what you are purchasing…. Carbohydrates will all affect your blood glucose. Overall, plan, prepare, and know your food labels. 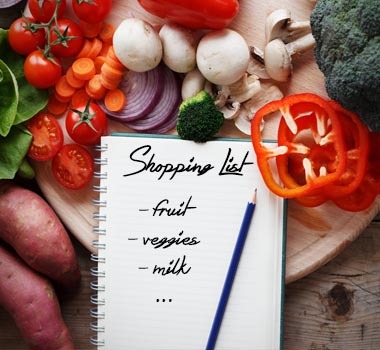 Check with your Registered Dietitian or Certified Diabetes Educator for more meal prep and shopping tips. Many supermarket chains now employ full-time Registered Dietitians who offer in-store classes, tours and demonstrations!